Two weeks ago, Kevin Harvick was handed an L1 penalty. Last night, Kevin Harvick hosted the first show of his new season. He opened up the discussion on NASCAR inspections. The way it works is NASCAR hauls the cars back to Concord, North Carolina. Typically, it’s 3 cars. Then, they take the entire car apart, including the engine. They search the entire car for rule breaking scenarios. On Tuesday, NASCAR announces what they found if anything along with the corresponding penalties. For the West Coast races, it’s pushed back to Wednesday as it takes an extra day to get the car back across the country to the NASCAR R&D Center just to begin the inspection. “I don’t like handing the penalties out on Wednesday. I think it’s confusing to our fans. I think it’s confusing to the competitors,” Kevin Harvick details via his own radio show ‘Happy Hours’ via Sirius XM. In other words, once the car passes inspection at the track, the race is official. Yet, the car would still go back to the R&D Center. That would give NASCAR an opportunity to go through the car with a fine tooth comb. In the case that they find something, Kevin is suggesting that L1 penalties shouldn’t be handed out. 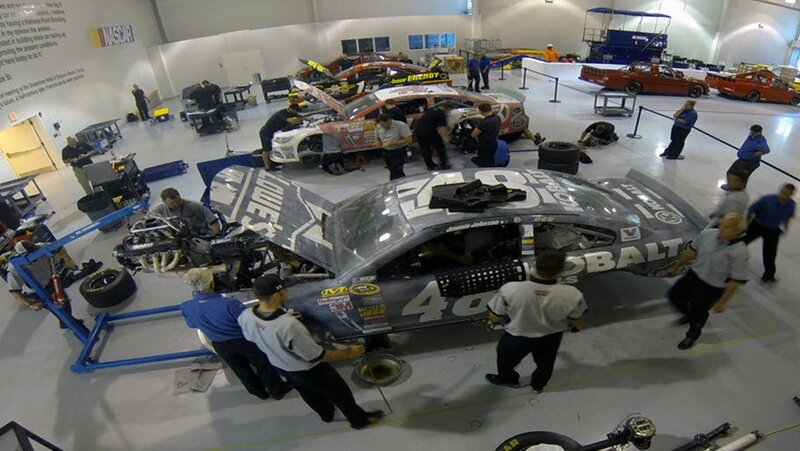 Instead, NASCAR can use that new found info to inspect the cars at the race track after the race in the following week. They could even issue a bulletin warning to the teams. The downside of this idea is that the at-track inspections would take significantly longer. NASCAR would simply end up checking more things at the track. Though, it certainly wouldn’t be longer than the 3 days it takes to complete the R&D Center inspections. It would also likely mean that NASCAR couldn’t check everything, the way they want to. Many might read that and think Harvick is just saying that because of what happened to him. Nope. He said the same thing last season, well before any of this happened to him. Beyond the window, the #4 team was also found to have illegal parts on their side skirts. That side skirt rule came out February 18th. Harvick and his Stewart-Haas Racing team take blame for that one. But, the most talked about portion of the penalty was the roof and rear window. The drooping roof caused the deformed window. All of that was the result of a part failure. If those photos never showed up on social media would you have been penalized?